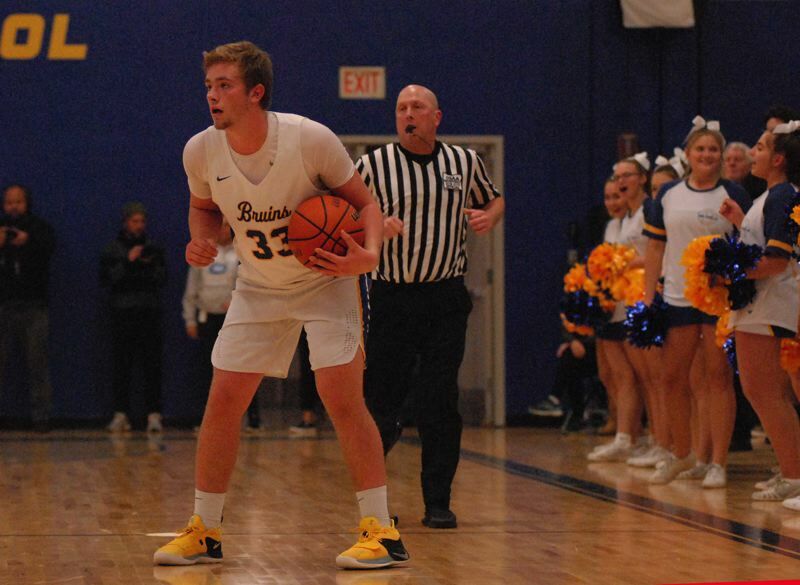 Barlow guard Evan Inglesby dribbled the left side and hung in the air a split-second longer than everyone else before releasing the biggest shot of the game. His floater from 8 feet out dropped softly through the net for the go-ahead basket with less than a minute to play in the Bruins' 99-95 double-overtime win over No. 1-ranked Jefferson on Friday night. Inglesby would hit three straight foul shots down the stretch to keep the Bruins in front by two with 13 seconds left. "It's about settling down and composure," Inglesby said. "It's just you and the rim. Take a deep breath and focus on your shot." After hitting less than half their free throws through most of the game, Barlow sank 9 of 11 (.818) in the second overtime. Jefferson put the ball into the hands of its star player Marcus Tsohonis, a University of Washington commit, in its quest to force a third extra session. He dribbled down the left side, but his contested layup came off the backboard and rimmed out. The ball was swatted out to the top of the arc where Charles Ndayizeye beat everyone to the spot, took the ball off the bounce and got in two quick dribbles before being grabbed from behind. "The game was on the line, so I did whatever I could to get my hands on that ball," Ndayizeye said. "It's all about practice, preparation and believing in each other." He swished two free throws at the other end to secure the victory. Jefferson had a chance to go up six points with 1:15 left in regulation, but a missed dunk proved costly in crunch time. The Bruins inched closer when Jared Vedus found Inglesby cutting to the hoop for a layup. Jefferson missed a couple free throws down the stretch, and Barlow found itself down three heading into its last possession. The Bruins moved the ball around with a series of passes, but leading scorer Jesse White was being tightly covered. Eventually, the ball found its way to Joey Wolcott in the corner, who rose up and fired. "I remember I got the ball and I wanted to take a look at the clock, but instead I just shot it," Wolcott said. "The defender closed out on me, and I didn't see the ball go through. The next thing I knew everyone was swarming me, and I thought 'Well, that's nice'." Still, Jefferson had a chance to win it with 0:05 still to play, but Inglesby zeroed in on Tsohonis and lunged at him to block his shot from near the top of the arc. "I had watched a lot of his highlight film, and he goes into attack mode in those situations," Inglesby said. "I figured he'd be the one taking it, and I was lucky enough to get a piece of his shot." Inglesby nearly brought the house down when he gathered the loose ball and swished a shot from the other side of halfcourt, but the buzzer had already sounded to force overtime. Jefferson came up empty on its first seven possessions of overtime. Vedus poked a ball loose for a steal, Jaren Hunter drew a charge. The Democrats could not score. Despite, the stellar defense, the Bruins were only able to manage a two-point lead on a spinning layup by White. "We got a little anxious in overtime. We had some opportunities, but we needed to be more patient," Barlow coach Tom Johnson said. "We had some bad possessions." Jefferson moved in front on a three-point play by Tsohonis with 0:23 left. Barlow answered with Jaren Hunter finding Wolcott on a backdoor cut to return the Bruins to the lead. Tsohonis received a quick inbounds pass and went coast-to-coast to force a second overtime tied at 83. The teams traded the lead five times through two overtime periods. Barlow got out to a 12-4 lead after Inglesby picked off a pass at half court and went alone to the hoop for a two-handed dunk. Jefferson finished the first quarter with a flurry that saw Nate Rawlins-Kibonge power home a dunk of his own, while Tsohonis swiped the inbounds pass and went up at the buzzer to give the Democrats a 20-16 lead. 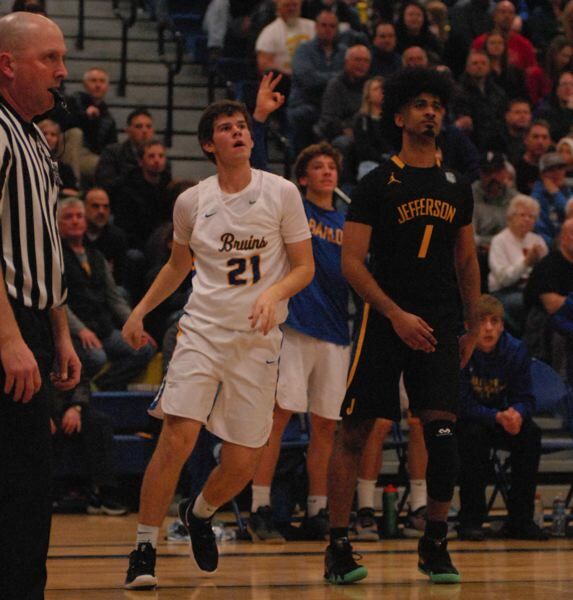 Jefferson would grow the margin to as many as 10 points in the second quarter, but Barlow got back into striking distance by halftime after Inglesby took on two Democrats for a layup at the rim, and White sank a 3-pointer. The third quarter featured an entertaining series that saw the lead change hands on seven consecutive trips down the floor. Hunter highlighted the Barlow scoring with a no-look pass from half court that found White for a layup. "It was a battle back and forth all night," White said. "They would go on a run, and we'd get hot on 3s and be right back in it." White brought the crowd to its feet when he pulled up alongside the center-court logo and swished a 3 — the longest of his five treys on the night. Late in the third, Ndayizeye stole and inbounds pass, and fired the ball to Wolcott, who in turn found White cutting to the basket for a layup that sent the Bruins into the fourth quarter with a 64-59 lead. 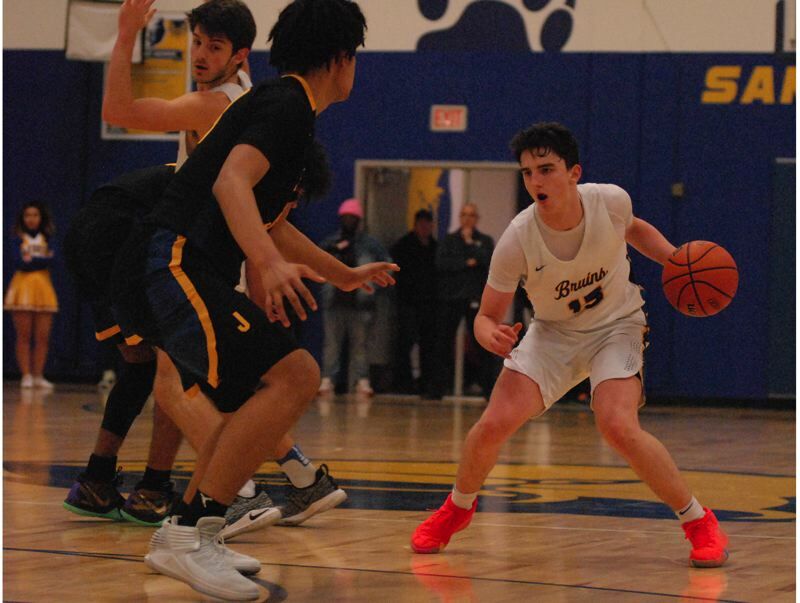 The Bruins had some nervous moments midway through the fourth when White absorbed contact on his way to the basket and was left sitting on the floor, reaching for his lower leg as action flowed the other way. A missed 3 from the corner and a turnover on a crossover attempt at the top of the arc showed that he wasn't at full strength. Although he never left the floor. During a teammate's free throw attempt, White could be seen at half court leaning into a sprinter's start position to stretch his calf muscle. "I was cramping up," White said. "Coach told me to be the decoy and open things up for everyone else." White managed one bucket in the overtime sessions, while five of his teammates picked up the scoring load. "Everyone here can handle the ball, and we are confident in each other to make plays," Inglesby said. "We knew if we played good team ball we could hang with them, and we did that all four quarters." "We have a lot of offensive weapons — a lot of guys that the other team has to be aware of," Johnson said. Jefferson (95) — Marcus Tshonis 30, Keylin Vance 15, Kamron Robinson 12, Jalen Brown 11, Nate Rawlins-Kibonge 10, Trevon Richmond 8, Rayven Turner 6, Lamar Washington 3. Barlow (99) — Jesse White 38, Evan Inglesby 21, Joey Wolcott 12, Jaren Hunter 11, Dominic Jacoby 8, Charles Ndayizeye 6, Jared Vedus 5, Nomie. This story is slated for our Tuesday, Dec. 11, print edition.